So I'm not dead. I haven't updated my blog lately as I haven't done much in the way of painting figures or playing board games. I bought a new computer last month and I've been fanatically playing Mechwarrior Online. I have played a few new board games in the interim. Couple weeks ago a friend of mine received his Kickstarter copy of In the Name of Odin by NSKN Games. 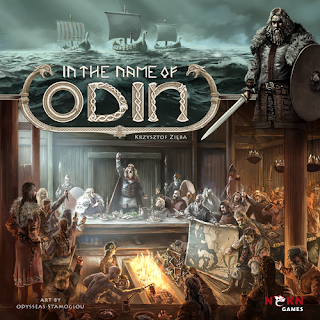 In this game you're a hero who is trying to become the new Jarl. Through the use of card playing and activating buildings in your village, you raise a small force of guys composed of sailors, traders and warriors. You then use this force to go on various raids. The player with the most fame at the end is the winner. The quality of the components was good although there was one thing noticeably absent and that's a quick reference sheet. It could really use one as there are a number of actions/abilities a player could do and they're not noted anywhere except in the rulebook. I'll look on BGG to see if someone has come up with one. The game played quite quickly and a 3-player game could easily get done in an hour if all the players know the rules and are paying attention. 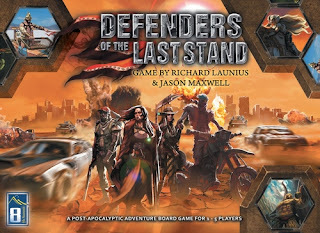 The second new game I played was Defenders of the Last Stand by 8th Summit. Terry had just received his Kickstarter copy so he brought it over for a run-through. In this post-apocalyptic game, the players are trying to keep their town of Last Stand alive. The players go on missions to retrieve ancient items all the while trying to stem/stop the flow of raiders that are inbound to the town. There is 4 raider groups each led by a big boss. The players win the game by killing all four of the big bosses. We only played till we had killed one of them. As it was getting late we halted the game. The quality of the components is good with a fair number of cards and plastic figures. The game is pretty simple to play, just very long. We played rather cautiously so maybe it would go faster if we had played more dangerously. The one odd thing was it only came with two player references, which is odd for a 1-5 player game. Still on my paint table are a number of French vehicles, although three of them are getting close to being done.